Editor’s Note: Farah is an Afghan-American businesswoman in Kabul. The opinions expressed in this guest blog are solely those of Farah. Afghanistan has been the graveyard and battlefield of empires for centuries. Now I see the slow tortuous death of my ancestral nation and people. Sacrifice of the lambs - that is what I feel our people have become. NATO is six months into an 18-month counterinsurgency plan aimed at turning the tide of the nearly 9-year war in Afghanistan. In the coming months, the focus of both ground operations and the rebuilding mission will be on the southern province of Kandahar - the spiritual home of the Taliban. Success here is perhaps one of the last chances to keep support for the war alive among Afghans. When you meet him, it is easy to see why he is so popular. He is well-educated, West Point and Princeton doctorates; politically savvy, no nasty quotes in Rolling Stone or anywhere else; and very personable. So it distresses me, but I feel feel honor-bound to point out that the Iraq he left behind is in shambles; that he is not applying what worked in Iraq to Afghanistan; and that the challenges there are much more daunting than in Iraq. Read the full Opinion from Amitai Etzioni, a professor of international relations at George Washington University and the author of several books, including "Security First" and "New Common Ground." 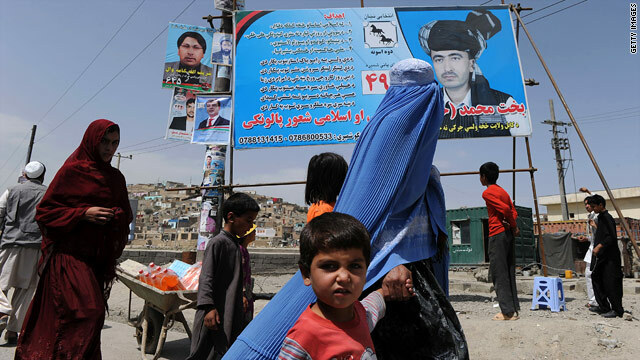 Opinion: Federal system only option for Taliban, U.S.
Editor’s Note: Abbas Daiyar began his blog, Kabul Perspective, last year to look at issues in Kabul and around the world. He has worked with newspapers in Pakistan and reported for news agencies in the past and is now a member of the editorial board of the independent Daily Outlook Afghanistan newspaper in Kabul. The opinions expressed in this guest blog are solely those of Abbas Daiyar. Princeton, New Jersey — Despite all the questions surrounding the war in Afghanistan, congressional Democrats have not challenged the administration's policies since President Obama announced a surge of troops in 2009. But Democrats who have doubts about the war can't afford to be silent. When Congress doesn't publicly ask tough questions of the White House, poor decisions have often ensued. The decision over funding Afghanistan came one week before the the 46th anniversary of the passage of the Gulf of Tonkin Resolution on August 7, 1964. Read more from Julian E. Zelizer, a professor of history and public affairs at Princeton University, who says a look back at the Gulf of Tonkin incident provides a cautionary tale for today's Afghan war, and that Congress must closely scrutinize a president's decisions on war strategy. Take a look at some of the top stories and editorials in Afghan media related to the WikiLeaks documents coverage, especially the alleged role of Pakistan's ISI. Excerpts are compiled from a U.N. Assistance Mission in Afghanistan report. The mother lode of ground-level raw intelligence from the Afghan war disseminated by WikiLeaks may ultimately bring about some good. In the short term, however, it will almost surely further undermine the U.S.-led search for stability. Sifting through some of the 92,000 records is likely to strike an informed reader that there is nothing here that fundamentally alters his judgment about the war so much as it provides a level of granularity often missing from daily news reports. Indeed, almost every issue has been previously reported in major news outlets, albeit with perhaps less authority than is permitted by these electronic records. Read the full Opinion from Patrick Cronin, a senior adviser and senior director of the Asia-Pacific Security Program at the Center for a New American Security. Gen. David Petraeus, the new commander of NATO troops in Afghanistan, has called for labeling the leaders of the insurgent Haqqani network as terrorists. I've met Gen. Petraeus only briefly, and I am convinced that he is not trying to pull another McChrystal, to push the White House to become even more deeply mired in the war in Afghanistan. Hence the only way one can interpret the troubling news that he wants to brand the insurgent group with the terrorist label is that he has the support of his civilian superiors for such a move. Read more of the opinion of Amitai Etzioni, a professor of international relations at George Washington University and the author of several books, including "Security First" and "New Common Ground."